Often times when you are searching for a swimming pool cleaning service to help maintain your pool you end up at a dead end. It is very easy to search and really not know what you're looking for because pool maintenance is difficult to understand. That is why we have a "frequently asked questions" section here for you. Hopefully it will make you think of questions that you didn't originally think of while gaining a better understanding. If you have a question and it's not listed here please don't hesitate to reach out to us! Have a question? Looking for a free estimate? Want to learn more about our swimming pool cleaning service? Do you need help resolving a problem with your pool? Take a look at our packages and contact us today! Is a pool service worth it? A pool service saves you time and money while reducing your stress. Maintaining a pool can be tedious work. Unless you enjoy the science behind maintaining your pool, or due to financial reasons, having a professional pool service could very well be the best decision you can make in regards to your pool. Your time is way more valuable than the cost of service. Think of the extra quality time to spend with family. Less stress, fewer headaches, fewer details, more fun. Take a quick look at our packages to see what is best for you! Is price the most important factor when considering a pool service company? Definitely not. We all know the old adage “you get what you pay for” right? In other words, “cheaper isn’t always better”. For example, you might get a cheaper price from someone who is trying to break into the industry but they don’t have the experience. Because of this, they can’t warrant charging higher prices so they go cheap to get business. The risk is that their inexperience in proper pool maintenance can end up costing you dearly. Here are the questions you should be asking your potential pool service companies before you begin price comparisons. Is the pool company properly licensed and insured in your state or municipality? By licensed we mean a state Pool & Spa Contractors License. Are they certified pool and spa operators (CPO) through the National Swimming Pool Foundation (NSPF)? Do they have a high level of customer service and proof of their clients satisfaction. If you can find multiple pool service companies bearing the criteria above, then call them all for a free estimate. At this point you’re comparing apples to apples and it’s okay to compare prices. Contact us so we can help you! We can take care of every pool need except for resurfacing a pool or building a new one. We do have a quality referral for that, however. Check out our services page for complete details! How often will you service my pool? It is completely up to you regardless of which service package you choose. We do prefer to service weekly to make sure your pool stays in tip top shape. If you need your pool cleaned before a certain day (for a pool party other special occasion) we will do our very best to accommodate you! Each team member is more qualified than the majority of the competition. 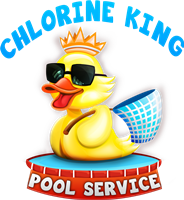 Chlorine King Pool Service is a state Licensed Certified Pool and Spa Contractor along with being C.P.O. certified and also insured. They are well trained and take pride in their workmanship. Being worthy of your trust is one of our most valuable intangible assets we are able to earn from you. Our customers with locks on their gates have no hesitation to hand us the key to their home. That speaks volumes! See what our customers have to say! Do you provide any other services than pool cleaning & repair? We have a host of services we offer. The only things we really don't handle are renovations and building pools. However, we have a great referral for that. We do tons of things such as cleaning, repairs, installations and inspections to name a few. Check out our list of services we offer. If you have a unique situation contact us and we'll be glad to help! Are there extra costs that are not covered in the monthly service? Our services cover all basic maintenance services included in our packages. Some services that may cost extra are: (1) filter cleaning is recommended every 4.5-6 months and is charged as an add on service and (2) cleanup from major storms. We will give you a written estimate that requires your approval prior to rendering any services outside of the monthly cleaning package you choose. Our goal is not to gouge you like other companies do so regardless what arises we will make you happy! How quickly can you start on my pool? This is a great question. Usually we are able to meet with you within 24 hours while 48 hours being the absolute longest in very rare cases. We very rarely have a delay of more than 2 business days before we can get started on any type of job you may have. Give us a shout so we can get the ball rolling! Are chemicals included in your cleaning service? Yes absolutely. As long as we are working with you there is no need for you to purchase and/or store any kind of chemicals at your home. We have you covered! Everything is taken care of with our services we provide for you! Is it difficult to get in touch with you? We always want to be readily accessible for you! If for any reason you are unable to get a hold of us right away, have no worries, we will return your call promptly. You also can email us at anytime and we will respond to you within 12 hours. The majority of the time will be within an hour. You will also be given a cell phone number on the first day of service. Finally, we have a chat feature on our website (lower right corner of your screen), just click that and chat live with us. Here is our contact page so you can reach us however you wish! Are you a contract only based pool company? We understand how contracts can scare people off. Because of that we do not require contracts for our service. We want the quality of our service to keep you. We do require to have our clients E-Sign a terms of service agreement (not a contract) because meeting your expectations is our number one priority. That is why we love our terms of service. It spells out our services and policies and you know exactly what services are covered so it really is a win-win. If you want to see a copy of the terms of service, just send us an email. If you have another idea we are all ears! The very first thing to do is measure your pool twice in the same day. If you think you have a leak, measure the water level in the morning time and then once more in the evening time. If you are losing 1/3 of an inch of water every day you may have a leak. Unless you or your kids are doing cannonball after cannonball then it might be a good idea to have it checked out. Give us a call or shoot us an email so we can come out and check it out for you!